Located on the rolling hills of the Palouse, researchers at WSU are surrounded by agricultural activities which provide ample opportunities for air quality research. Some of our current projects involve measuring gas and particle emissions from dairy and cattle feedlot facilities, understanding gaseous losses of compounds containing nitrogen from agricultural systems, and estimating windblown dust events from the entire Columbia Plateau Region. We also developed and operate the ClearSky smoke dispersion forecast system for agricultural field burning. Emissions of ammonia, methane, and nitrous oxide are important for air quality and global change issues and currently we do not have reliable estimates of the emission rates from these sources. Ammonia is important for odor problems and at high enough levels it can damage sensitive ecosystems and the respiratory tract of both humans and animals. Gaseous ammonia is removed from the atmosphere via rainout, dry deposition, or formation of aerosols which are ultimately removed via deposition also. Ammonium aerosols can play a significant role in regional haze. Both nitrous oxide and methane are contributors to global climate change because of their long residence time in the troposphere and stratosphere where they contribute to warming and ozone depletion. Particulate Matter (PM) is a visibility nuisance, can cause irritations to the throat and respiratory tract, and in general is a health concern (i.e., asthma). Animal agriculture in the U.S. has become increasingly concentrated with fewer producers managing larger numbers of animals on smaller land areas. This concentration creates manure management, and water and air quality issues and has resulted in increasing scrutiny by the public and by local, state, and federal environmental agencies. Our goal with this project is to make emission measurements of ammonia, nitrous oxide, methane, fugitive dust and odor compounds for improving the models used to predict air emissions. 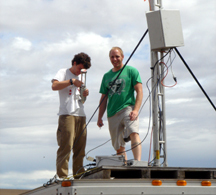 The methods used to measure emission fluxes include eddy covariance/accumulation procedures, surface enclosures, tracer ratio techniques and inverse dispersion modeling. Since we can't measure emissions from all of the CAFOs (over 5000 nationwide), modeling is necessary in order to predict emissions from operations across the country which represent different climates and management practices. This research will provide a scientifically sound basis from which to recommend best management practices for CAFOs and help develop air emission policies based on a whole system approach. 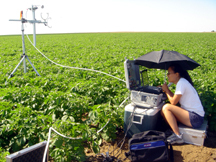 LAR graduate Mary Capiral monitoring N2O emissions in a potato field. Irrigated crops in Central Washington, particularly potatoes and corn, are intensively managed with high input of fertilizers, pesticides, herbicides, and water. Nitrogen inputs (in the fertilizer), increase the risk of nitrogen losses in the drainage water, but they also set the stage for gaseous losses of nitrogen from the soil (ammonia (NH3), nitrous oxide (N2O), nitric oxide (NO)) and the crop canopy (NH3). Our goal is to measure and model the emission of NH3, N2O, and NO from irrigated cropland. The data obtained with the measurement will be used to parameterize a soil-canopy model of ammonia emission, and to test the denitrification algorithm already incorporated in CropSyst, a comprehensive multi-year multi-crop cropping system model. The results of this project will improve our understanding of the loss of gaseous nitrogen species from irrigated croplands and provide a better basis to account for the impact of these emissions upon regional air quality and global climate change. In a collaborative project between WSU LAR, WSU Biosystems Engineering Department, and the USDA-Agricultural Research Service (ARS), progress is underway to incorporate a stand-alone Wind Erosion Prediction System (WEPS) into the real-time gridded numerical regional modeling system called AIRPACT. NRCS-WEPS, developed by the USDA, is a process-based, hourly time-step model that predicts wind erosion of agricultural soil. WEPS simulates fundamental processes, including soil crusting due to precipitation, crust disturbance by plant growth and farming practices, and soil movement due to wind. In its original form, WEPS uses climatological data to simulate daily meteorology over a yearly simulation for spatially detailed field conditions at a specific geographical location. In AIRPACT, WEPS will use daily meteorology from the MM5 forecasting system, geospatial databases of soil and agricultural management to support wind erosion calculations across a large area of the Columbia Plateau. Thus, AIRPACT will use WEPS to estimate hourly PM10 emissions. Atmospheric ammonia emissions are a growing environmental and human health concern in the US. Agricultural activities are the dominant global source of ammonia emissions and a major environmental concern. In the U.S., approximately 85% of ammonia emissions come from livestock operations and dairy farms constitute a large fraction of the livestock inventory. The noxious odor from ammonia at dairies is an acute problem, and is a particular problem where urbanization has encroached on traditional farmlands. Ammonia is a major source of secondary PM2.5 which is regulated by the EPA. A sensitive new differential optical absorption spectroscopy (DOAS) instrument was constructed at WSU in 2000 and has been used to characterize the ammonia emissions from the WSU research dairy. These emissions come mainly from the stall areas, the slurry lagoons used to store waste, and application of slurry onto fields surrounding the dairy. A number of papers on this innovative new work have been published by LAR researchers.